The first step towards a clean and healthy skin is knowing the different types of face wash available. 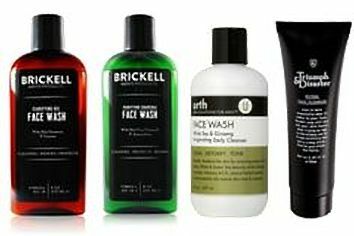 So, which are these types of face wash for men and how do we use them? You will learn all these plus more in this post. Proper skincare is usually a journey…with several landmark processes along the way. For one, you need to make sure that your face is sparkling clean so removing dirt and cleansing is a must. Then you need to ensure it’s properly hydrated. And perhaps protect your skin against hazards such as the sun. Cleansing removes excess oil, sweat, dirt plus dead skin cells. It also refreshes your skin on top of giving your complexion room to breathe. Now, a face cleanser is the facial care product targeted at removing all these and other pollutants from your face. If you have been exposed to heavy dust and more elements, use a cleanser before applying a face wash. The best thing about a cleanser is that since it’s not a foaming liquid, you don’t have to wash it out. Because of its foaming property, it’s considered more of soap. The best face washes for men are a bit harsher (compared to pure cleansers) and will thoroughly clean. In the end, you feel cleaner and refreshed. Facial scrubs are another essential component of a healthy skin care routine. In essence, a face scrub is a cream-based skincare product with tiny exfoliating pieces and is normally massaged across your skin to help smoothen it- by physically lifting any dry/dead skin cells. Remember to apply a moisturizer after your face toner has dried. A moisturizer is a complex mixture of various chemical agents and helps to hold water in your skin after application. It also attracts moisture and smoothens your skin. As a result, a face moisturizer makes the outside of your facial skin soft and more pliable. And by reducing evaporation, they boost your skin’s hydration (water content). For your skin to achieve the brilliance you’ve always wanted, knowing the different types of face wash for men will be paramount. Thanks to this post, you can now differentiate between a face wash, a facial cleanser, a face toner, a moisturizer, and even a face scrub. Subscribe to our blog and receive notifications of new posts via email.